We have a fair idea who Face no.9 is but let us know if you can confirm his identity. He is pictured wearing the nasty blue away kit that had a "I've just painted me bathroom in it" look. 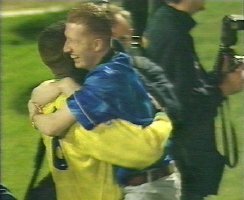 Andy Cole is the recipient of face no.9's affections at the end of the game at Grimsby's Blundell Park way back in 1993 (when we won a trophy).